WISCONSIN – A plane called the Delta, which is conducting flight from Madison, Wisconsin, to Atlanta, Georgia, should be transferred back to Madison on Friday, August 5. 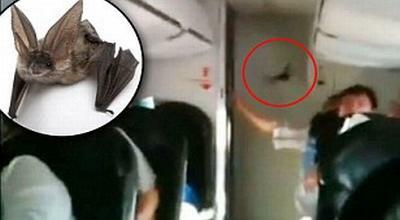 The reason is found a stowaway, the bat. Of course he made a tantrum the whole cabin. An unidentified passenger name record these events to be posted to CNN‘s iReport, forum news network for people who want to publish their own news. He also told how she was surprised when he woke from his sleep when he heard a scream and a passenger because of the presence of a bat. “I woke up when he heard the screams of someone who saw a bat. When I opened, the eyes of the bats was flying over my head, I immediately think to record it,” he said as quoted by Dailymail, Wednesday (08/10/2011). Bats are flying over the cabin, then fly up and down the hallway about four to five times. Fortunately the bat was trapped in the toilet. A passenger quickly closed the toilet door and locked it. While the bats are getting used to her new little room, resumed the flight to Madison. ~ by ickerz on 11 August 2011.